Roof caps come in many shapes and sizes, but the best of the best are the copper roof caps. A home that has been custom built for instance can tell a lot about its owner by reflecting in the architect special touches that sets the home apart from the others surrounding it. A homeowner who wants to make an impression might add special upgrades to areas of the home that might seem rather insignificant. Upgrading to copper roof caps might be one upgrade that might seem insignificant, but can add a fantastic finishing touch to a home. 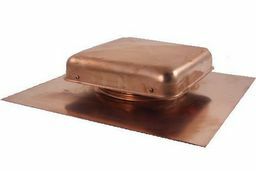 Though it might be true that copper roof caps are considered a luxury, there is much to be said about other benefits of upgrading to copper roof caps. Most roof caps are made from aluminum or a cheaper material that overtime begins to demonstrate some wear and year that can cost the homeowner repair cost as well as wasted energy costs. Copper chimney caps are made from galvanized copper that is a durable material able to resist rust, mildew and grimy buildup. By purchasing and installing copper roof caps a homeowner is not only adding a unique custom look to his or her home but is also adding value.